What Are Carnival Destiny Dining Options? 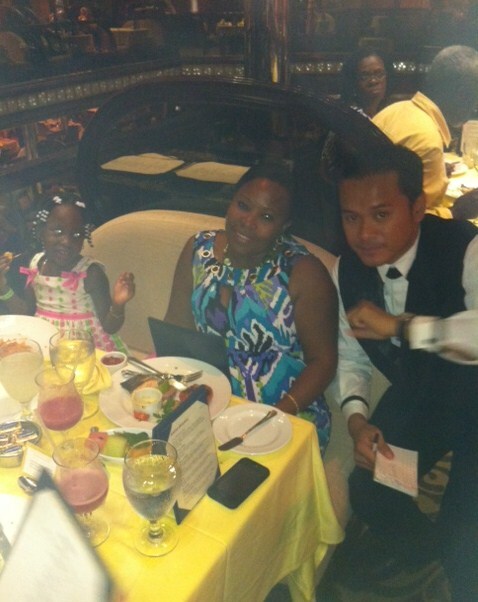 The meals on a Caribbean cruise are a big deal and Carnival Destiny dining options pass the test with flying colors. Whether you are sailing to Ocho Rios, Jamaica; Grand Cayman; the Turks & Caicos Islands or the Bahamas (a Bahama cruise), you will enjoy the dining options and meal choices offered on Carnival Destiny. 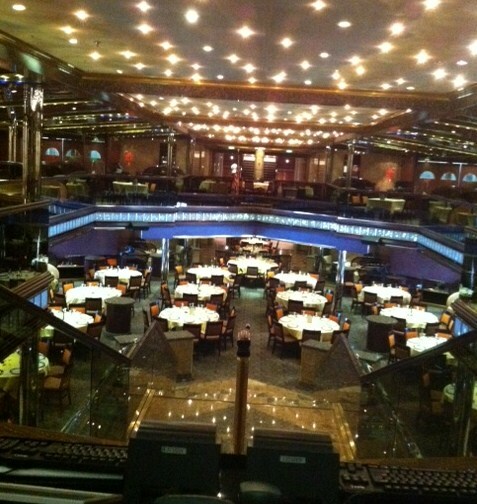 There are 2 formal dining rooms on Carnival Destiny: the Galaxy Dining Room and the Universe Dining Room. Each "Room" welcomes cruise passengers to assigned seats during early seating (starting at 6:00 p.m.) and late seating (starting at 8:15 p.m.). Cruise passengers may also choose "Your Time Dining" not having an assigned seat) and these are hosted in the Galaxy Dining Room from 5:45 - 9:30 p.m. In addition to having dinner in the main dining rooms, cruise guests are invited to "open seating" breakfast and lunch in the Universe Dining Room. It is understood that not everyone wants to be wined and dined in a formal setting - being served a 3 course meal. No problem! Carnival Destiny offers a buffet option for every meal. Your stop is the Sun and Sea Restaurant (Lido Deck 9 Aft). For each meal that is served in the formal dining room - breakfast, lunch and dinner, you have the option of eating in the Sun and Sea Restaurant. 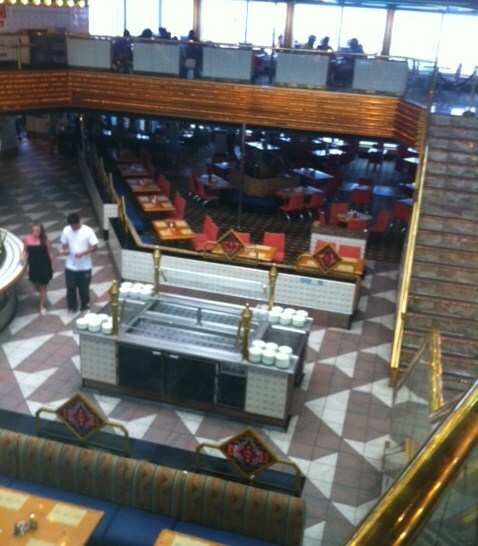 Many cruise guests tend to eat in the buffet restaurant especially for breakfast and lunch. Nothing beats variety and Carnival Destiny delivers just that. You have several other options for eating during the day. New York Deli (9 Aft) - You may Deli-like items for breakfast lunch and dinner here. 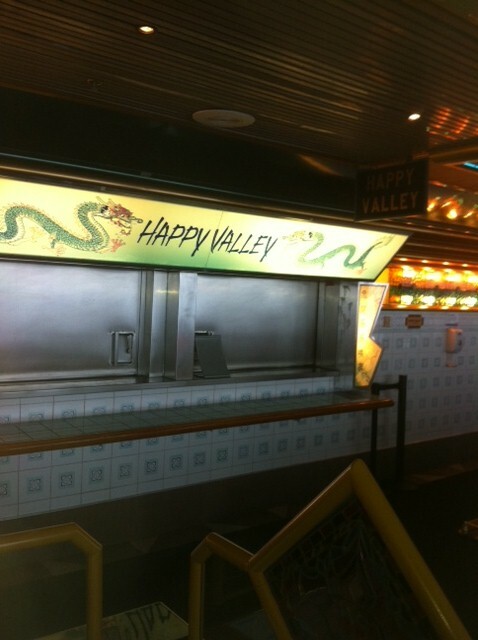 Happy Valley (9 Aft) - Who feels for Asian cuisine? Happy Valley delivers. Actually, they serve Chinese and other Asian meals. Sushi Bar (10 Aft) - Do you feel for Sushi? You will find that option on Carnival Destiny. 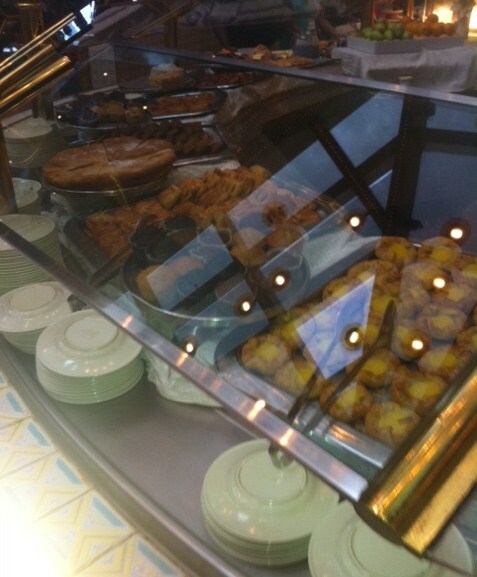 Cafe on the Way - Coffee and pastries, anyone? 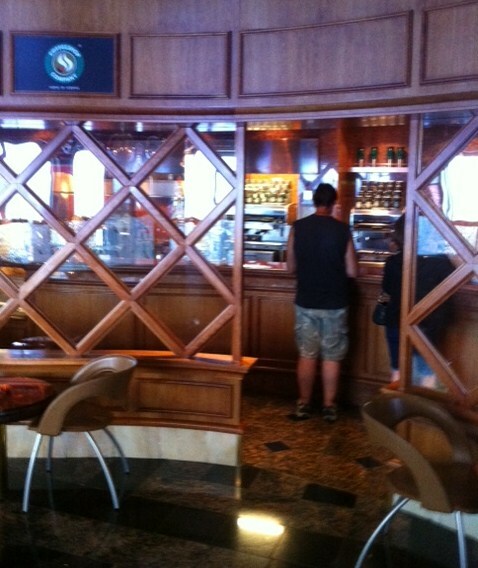 With 2 locations (Deck 5 Midship & Deck 9 Aft), you will be delighted to grab Latte, Cappuccino or Espresso. Your family members may also treat themselves to a thick milkshake (made-to-order), or try their tongue at fresh pastries. I know you have been eating all day, but somehow you still feel that you need a midnight snack - a little something before bed. Well, you have late night snacks on Carnival Destiny. These are generally served 11:30 p.m. to 1:00 a.m. in the Sun and Sea Restaurant (9 Aft). Do you just want to stay in your cabin today? Are you feeling a little seasick? Well, you do not need to miss out your cruise meals. Carnival Destiny offers 24 hours of room service and the menu is loaded. 1. Cold Sandwiches - Tuna Salad, Roast Turkey, Ham and Cheese, Peanut Butter and Jelly, Shrimp Salad on French Roll, etc. 2. Hot Sandwiches - Grilled American Cheese, Grilled Reuben With Corned Beef and Swiss Cheese, Chickent Fajita, Guacamole with Greens in a Jalapeno & Tomato Wrap, etc. 3. Salads - Mixed Greens, Caesar Salad and Assorted Vegetable Sticks with Blue Cheese Dip. 4. Desserts - New York Cheesecake, Assorted Cookies, Chocolate Cake, Fresh Fruit Salad and Strawberry Yogurt. 5. Beverages - Juices, Hot Tea, Hot Chocolate, Iced Tea and Milk (skimmed and Chocolate). Are there some food items that you could have all day? How about ice-cream, or pizza? I thought so. 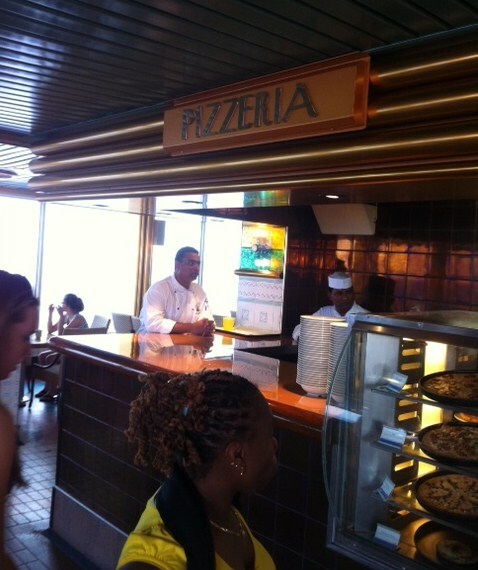 Yes, you can have ice-cream and pizza 24/7s on Carnival Destiny. There is no way that we could complete our page on meals onboard Destiny - ship sailing to the Caribbean and the Bahamas, without talking about food off the grill. You will have your hands on and sauce all over you as you bite into hamburgers, hotdogs and chicken tenders offered on Carnival Destiny. Watch out for that chili! Your grill is located in close proximity to one of Carnival Destiny's pools, so you may dip, then eat, and then dip again. After writing about all this food business, I am feeling hungry. 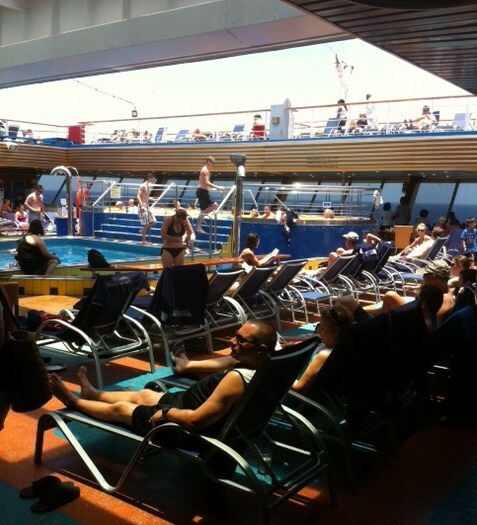 Even more so, I am wanting to get back on a Carnival Destiny cruise. Whenever you choose to sail to the Western Caribbean or the Bahamas onboard this ship, you will enjoy Carnival Destiny dining options.